A kayak is an excellent narrow and small watercraft generally propelled by double handed paddle. It is the best way to pass some time alone while boating on a calm river or lake. There are also a lot of varieties in a kayak for more precious type of kayaking. For example, a fishing kayak can provide you with fishing equipment so that you can fish more efficiently. A tandem kayak is for those who want to have fun with a friend or a partner. However, paddling a kayak is sometimes tiresome and can ruin your fun times. It is also inefficient while fishing. You want to have a paddle free kayaking experience, a kayak trolling motor is there for you. It will provide hustle free usage which can be very useful for fishing and speedy movement. For above reasons, a lot of anglers are using kayak with trolling motor to have more control over the boat while silently fishing. When choosing the best trolling motor for kayak, you might face difficulties to choose the right one. There are different factors available to consider before buying your desired trolling motor. Read more to know the details of these parameters. The most important factor while choosing a kayak trolling motor is to consider the type and size of the kayak. Although, most of the anglers are defined with the fact that, the bigger the trolling motor, the better it is. This is not the truth. A good quality oversized trolling motor can be way pricey for a small boat. A trolling motor should be chosen based on the size and type of the kayak. For example, a fifteen inches kayak will be properly fitted with 52 lbs. of thrust and 12 Volt motor. 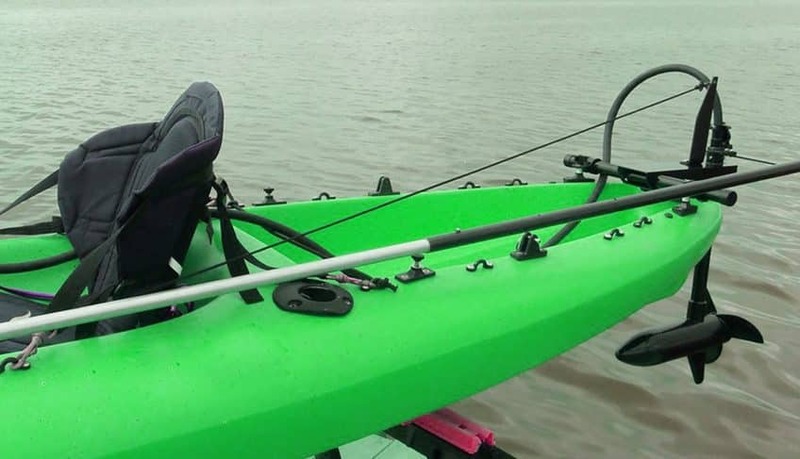 Larger size kayak with trolling motor may have 24 Volt trolling motor. But, here is the fact, a 24-volt trolling motor is inefficient for a long run as it will consume more power, and if your trolling motor is battery operated, it will loss the power way sooner than a 12 Volt one. The shaft or tube length is very important for a trolling motor. Kayak trolling motor mount can be in two different places, either in the bow or in the strain. Wherever, you install the trolling motor for kayak, the length of the shaft should be enough to submerge the propeller around one foot under water. However, this does not have the intention to express you have to buy a longer shaft than the required size. A too much longer sized shaft can easily interfere with the underwater obstacles, fishing lines and might interfere with your sitting arrangements when you stow it on the boat. According to a lot of anglers, water condition is not a considerable factor while buying trolling motor for a kayak. A lot of manufacturers also do not differentiate their trolling motors based on the water condition. However, it is wiser to consider this factor as important, whatever some people say about it. For example, if you are for saltwater then try to buy a trolling motor that is well covered to protect from saltwater corrosion. 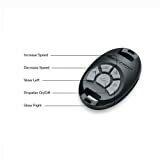 A kayak trolling motor will be easily damaged in salt water if it is not made with a whole lot of steel or some sort of corrosion resistant material. Fresh water kayak trolling motor does not require this kind of protection as there very less likely to be damaged by corrosion. 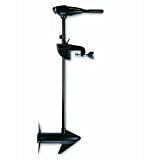 There are both freshwater and saltwater trolling motor available to buy from. 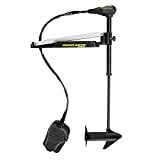 You will also find some trolling motor designed for both water types. These kayak trolling motors are excellent for those who have the preference to the boat in both fresh and salt water. Every kayak user should keep in mind that, the more powerful your kayak trolling motor, the better. It is always better to have extra power even if you do not need it for the moment than not having the power at all. Having more power might come useful in case of emergency times. The minimum requirement is to have 5 lbs. of thrust for every 400 lbs. of the boat to move it. However, this is the minimum requirement, and you require a lot more thrust to move smoothly. For this reason, small to medium size kayaks need around 40 lbs. of thrust. If your kayak is medium one and your boat in lake or river water, 30 to 46 pounds of thrust is required. If you are going for the swift current, you might consider having a kayak trolling motor with 55 pounds of thrust. However, beware of having a powerful battery as more the thrust, more power your motor will drain. The more powerful the motor, the more powerful battery it requires to run. So, considering the battery power while buying a trolling motor is very important. Plan to have a deep cycle battery for your trolling motor if you require more power. Initially, there are three categories of motor voltage can be found for kayak trolling motors, 12 volts, 24 volts and 36 volts. However, 12 volts and 24 volts electric trolling motors are more common among kayak users. If you use a higher voltage trolling motor, your battery will drain faster than your expectation. In these cases, try to have multiple deep cycle batteries to feed the voracious appetite of your trolling motor. If you do not require that much power, go for 12 volts one. It is efficient and less power consuming. Trolling motors can be found with different mounting positions. For small boats like kayak, there two mounting options; bow mounting and transom mounting. Kayak trolling motors with bow mounting are generally installed on the front section of the boat while the motors with transom mounting are installed on the stern. Some anglers prefer to use bow mount as it provides more maneuverability for larger boats. However, small boats like kayak are well suited with transom mounts, and it is the most common mount for most of the kayak users. However, kayak fishermen prefer bow mounting as it provides easier control over transom mounting. Buying a kayak trolling motor is not that heard. However, choosing the right one for the right purpose is really hard as the collection is too big. There are various types and various manufacturers to choose from. Our goal was to provide you with enough insights of kayak trolling motors so that you can choose the best kayak trolling motor for your need. By reading this article, we believe you have got insight to pick a kayak trolling motor confidently. If you still have any inquiry that asks for a reply, please write us back. Happy Kayaking!